The Huawei Mate 20 flagship lineup, which features one of the most awaited Android-powered devices this year, has leaked extensively already but up until now, there wasn’t any real-life picture of the phones and we could only rely on renders. Even though these leaked renders gave a pretty good idea of how the smartphone would look like, the new image gives us a glimpse of the real deal. 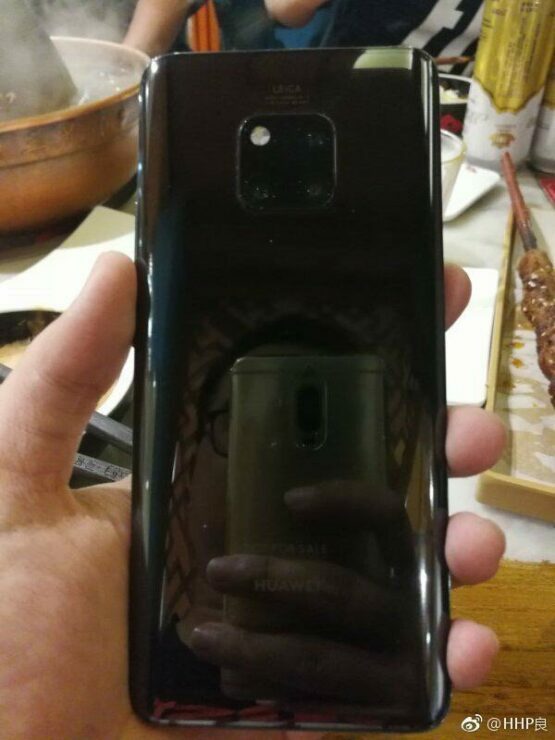 The image basically corroborates all the previous renders which indicated that the Huawei Mate 20 Pro will be huge and it will feature an interesting camera setup. 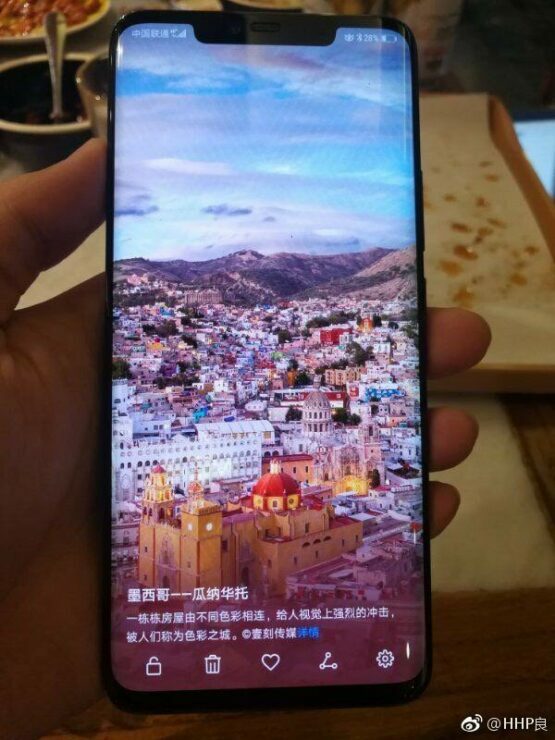 The pictures displaying the Mate 20 Pro reveal that the phone has a large 6.9-inch display with curved edges. 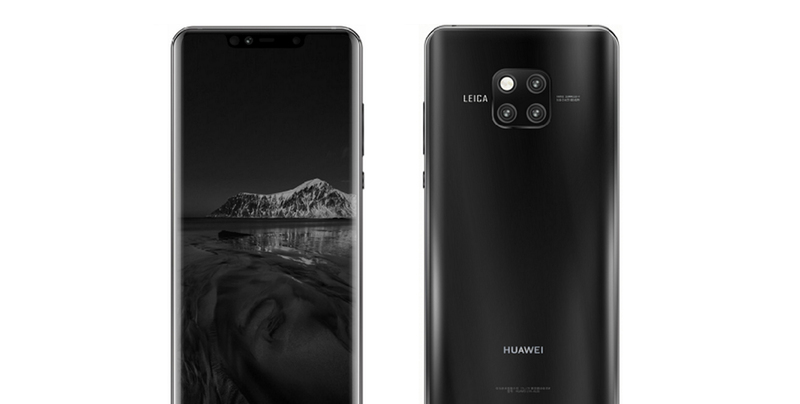 The screen-to-body ratio seems pretty high as there is only a small chin at the bottom and a notch at the top that presumably houses an advanced 3D facial recognition system, a selfie camera, and an earpiece. The Mate 20 Pro has a triple camera system on the back as well as an LED flash, aligned in a ‘two by two’ grid. There is a Leica branding at the top, but we reckon that both devices getting unveiled on October 16 will have improved sensors, allowing both of them to take some pretty impressive and detailed images. The Huawei Mate 20 Pro was expected to come in the colors Twilight, Blue, and Green, and this image has now hinted at a darker option. The black hued Mate 20 Pro looks incredibly stylish and the aesthetics are further enhanced by a reflective glass rear cover. Huawei will also release the smaller Mate 20 which will reportedly have a 6.5-inch display and a smaller teardrop-shaped notch alongside the gargantuan Mate 20 Pro. Both the phones will be powered by Huawei’s latest Kirin 980 SoC which is made using TSMC’s 7nm FinFET process.